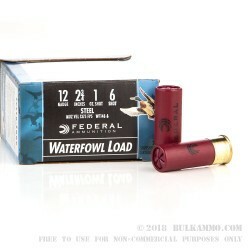 This 12 Gauge shell is loaded with one ounce of #6 steel shot. As is the case with steel, you’re apt to get less power and penetration when using it rather than lead. Where steel really shines is in its friendliness to the environment -- anyone who spends time where the birds thrive best know how precious those ecosystems are, and would happily trade away a little performance in consideration of keeping those areas pristine. 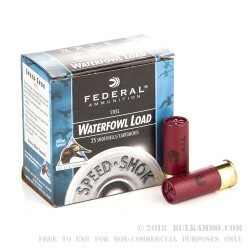 This shot is completely permissible for use in areas where state and federal laws bar toxic ammunition, and will reliably drop medium to large birds including turkey, grouse, pheasant, and especially duck with its excellent spread at 30 yards. 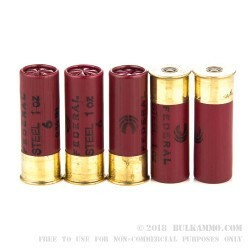 Federal puts tremendous care into their ammunition’s quality. This shell’s steel shot is perfectly round and will resist deformation in the barrel to provide exceptionally tight patterns. Its high-density plastic wad sports a gas sealing flange to launch each load with as much energy as possible, and its primer is designed to work even in moist environments. 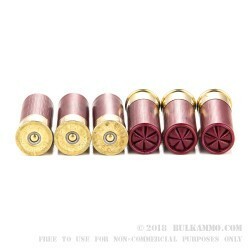 With 250 of these shells, you’ll have what it takes to reach the bag limit.